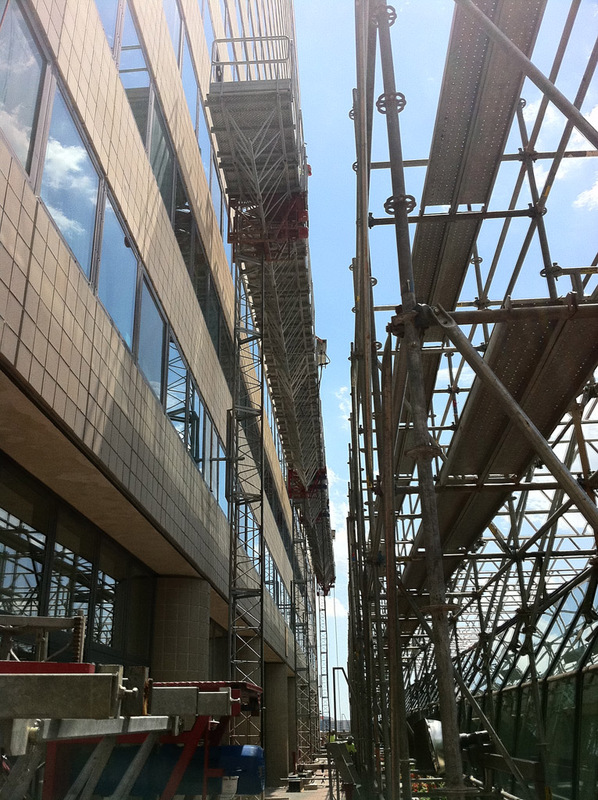 In the previous post we talked about our Suspended Scaffold Rental Division – and today we are going to look at our Mast Climber Rental Division – which is also a part of our Powered Access Division (along with Suspended Scaffolds). Mast climbing work platforms (MCWP) or Mast Climbers are particularly useful when access to a long span is needed so workers can quickly and easily move across the entire width of the wall or surface, at varying heights. These powered access platforms are popular with masonry contractors because they provide a safe, affordable, efficient access solution. 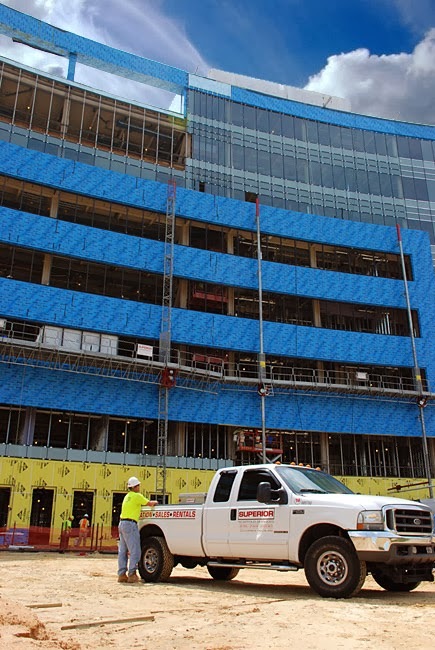 Superior Scaffold rents mast climbers that come in single, double or custom configurations depending upon the length and shape of the work platform needed. 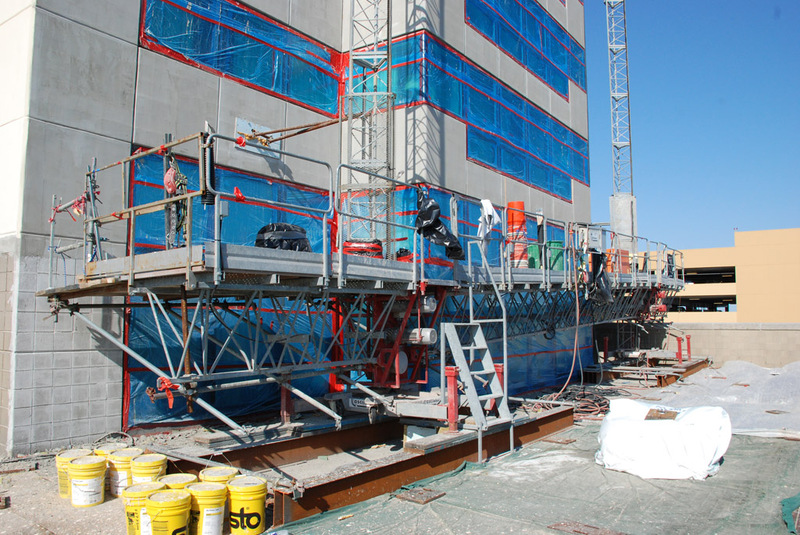 By using different size platform decks you can erect a mast climbing work platform to fit the lengths of just about any facade being accessed. Some places to use mast climbers: Medical center, school, hospital, factory, silo, church, prison, residential project, casino, warehouse, super market and more. 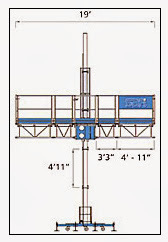 Here are some popular rental items from our Mast Climber Division. Heavy duty Mast Climber line (MC-3615) Shown in twin configuration. Light duty Mast Climber line (MC-10) shown in single mast configuration. Please call (215) 743-2200 and ask for Bob (Ext. 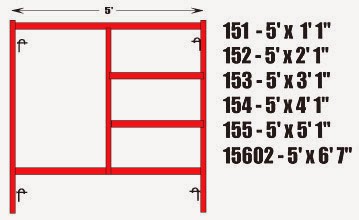 105) or visit: http://www.superiorscaffold.com. It’s true. We rent just about everything. 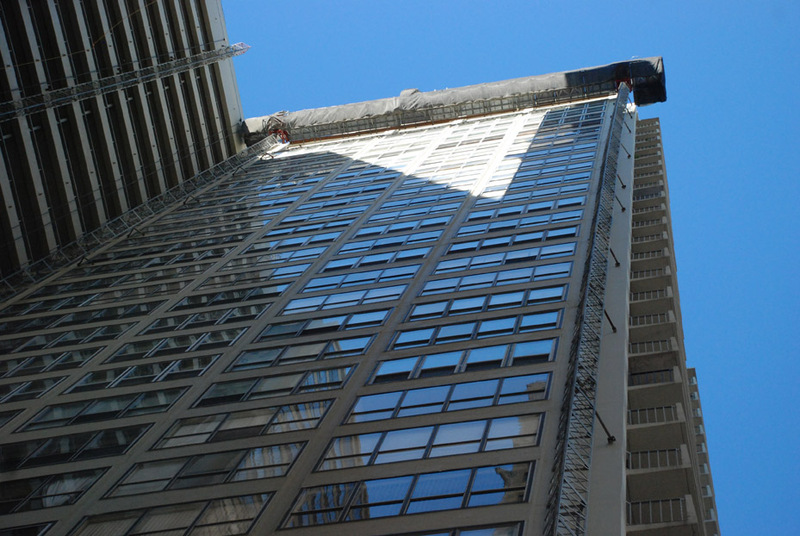 Many people know Superior Scaffold as a premiere scaffolding company that designs and implements scaffolding and access solutions for all types for customers and general contractors. But for those of you who don’t know we also have a top notch rental department where you can get all kinds of equipment for just about any project. Here, let Dave give you a quick run down. 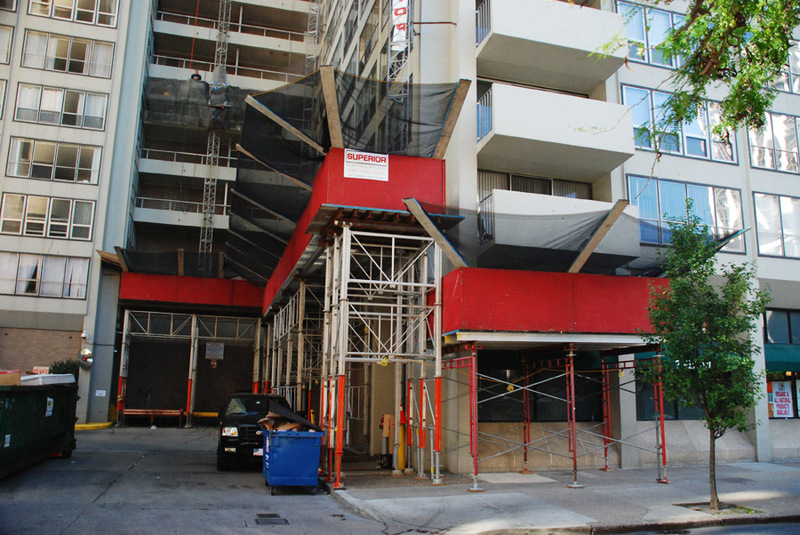 So whether you are a general contractor, a do it your-selfer, or a regular scaffolding guru – we have you covered. I thought I’d feature a few items from frame rental division (all of which can be found on our website.) We have thousands of items so call Dave at (215) 743-2200 and he will take care of you. 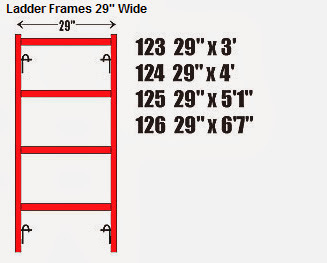 Here are some popular rental items from our Frame scaffold rental division. 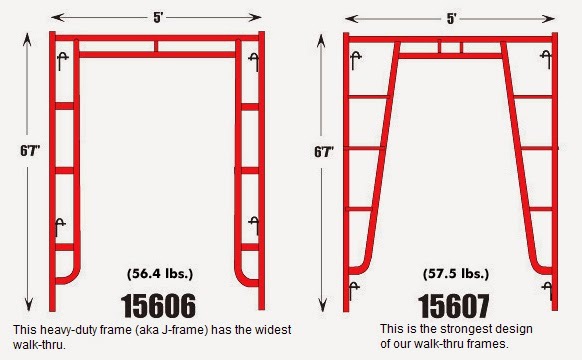 15606 – (aka J frame) has the widest walk through. We have scaffold, access ladders, ladders, stairs, railings, guard rails and rope & wheel systems for scaffolding. Scaffold and scaffolding accessories like screw jack, base plate, caster, coupling pin, pins, saddle, and fasteners. But if you dug deeper into the first photo you would see, as I did, a much more complex set of circumstances at play here. 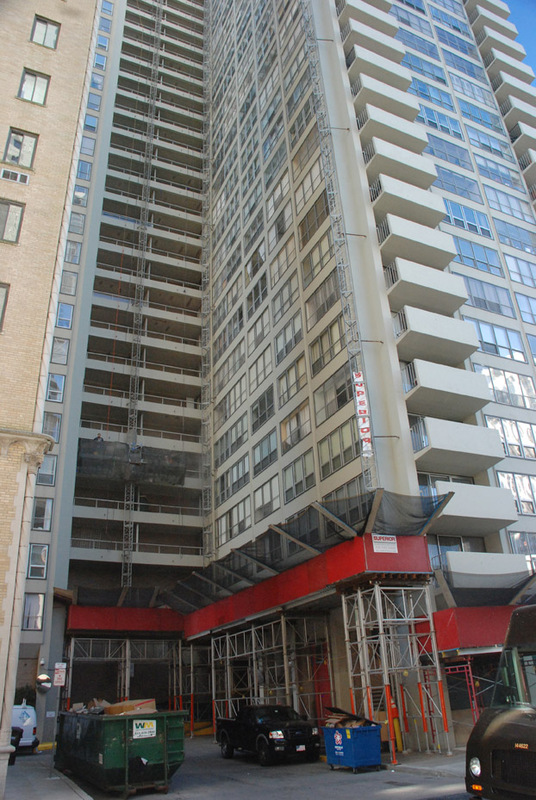 Not only did Superior Scaffold master estimator, Tom Cruise, aka Tony Pini, have to get the mast climbers up to the sky and into the stratus to do facade restoration but he had to build a custom entryway that would allow delivery trucks to maintain their daily routes in and out of the back of The Dorchester Apartments. So, you will see two different levels of overhead protection going on here. Subtle, yes, but there nonetheless. If you look carefully, there are two sections of the loading dock that needed constant access, the main dock and smaller trash pickup area. And then the mast climbers sit on top of the overhead protection – all out of the way. If you actually take a minute to stop and smell the roses or construction dust – you might see something deeper than it appears on the surface. Like this shot. Seems simple right? You bet. 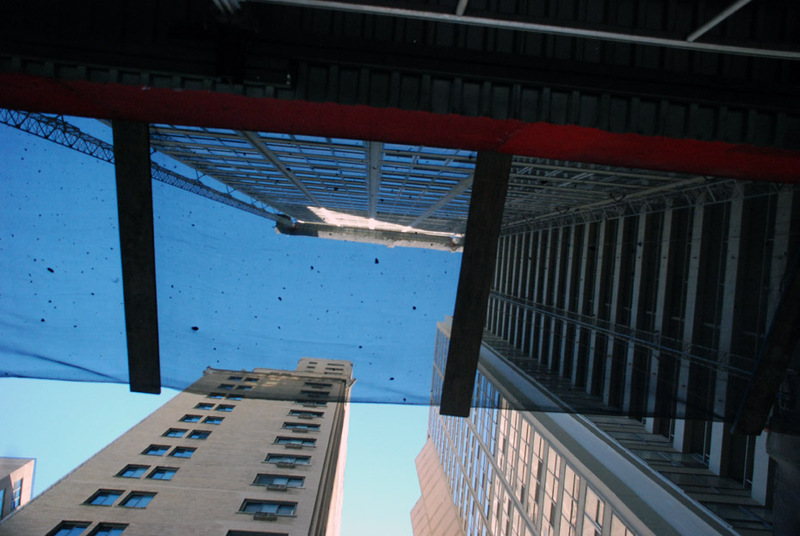 The debris netting that is put up to capture falling debris and prevent it from landing on the ground has done it’s job. Here you can also see the single mastclimber MC-10 (with platforms) on the left that fits nicely into the smaller recessed area of the building. And to the right is the larger mastclimber that provides access to the entire wall and even around the corner with the added return. 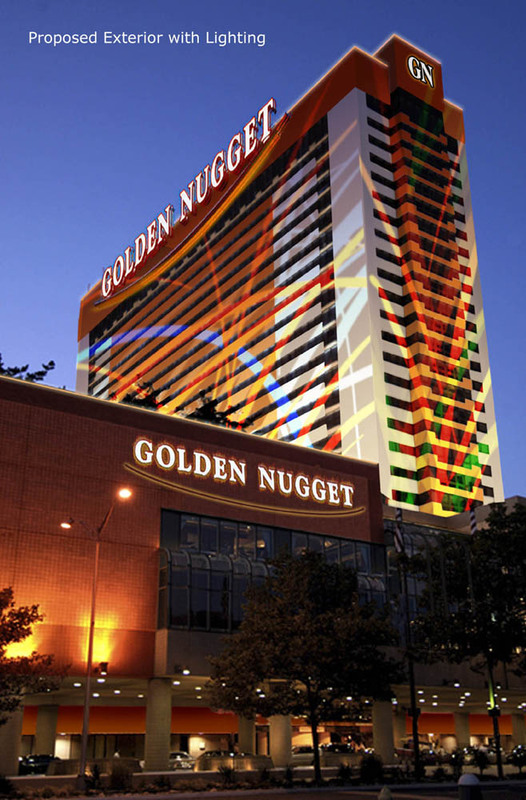 Cool Technology X-Ray for a facade renovation at the Golden Nugget Hotel Casino! Why? Now I’ll be honest with you. I’m a sucker for cool technologies being used in innovative ways (just see my previous blog entry about the hanging scaffold system). 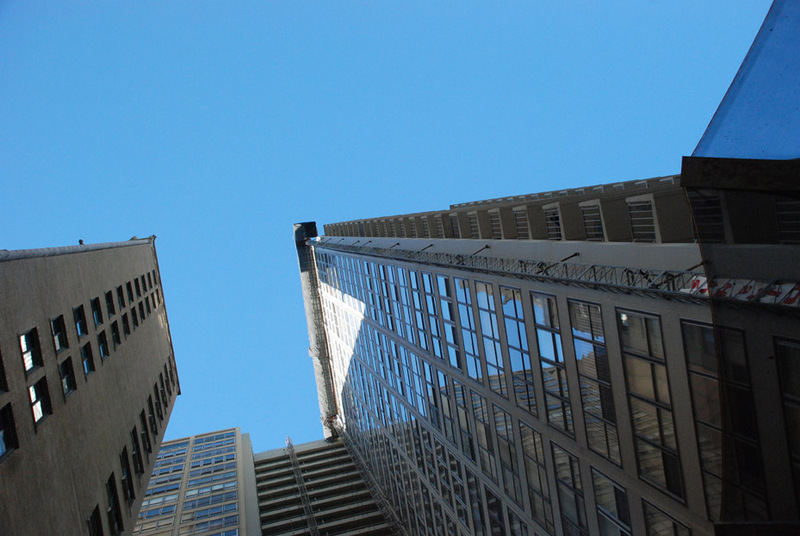 But when I learned what Superior Scaffold had to go through to get their giant mast climbers up to do the renovation work, I had to blog about it. 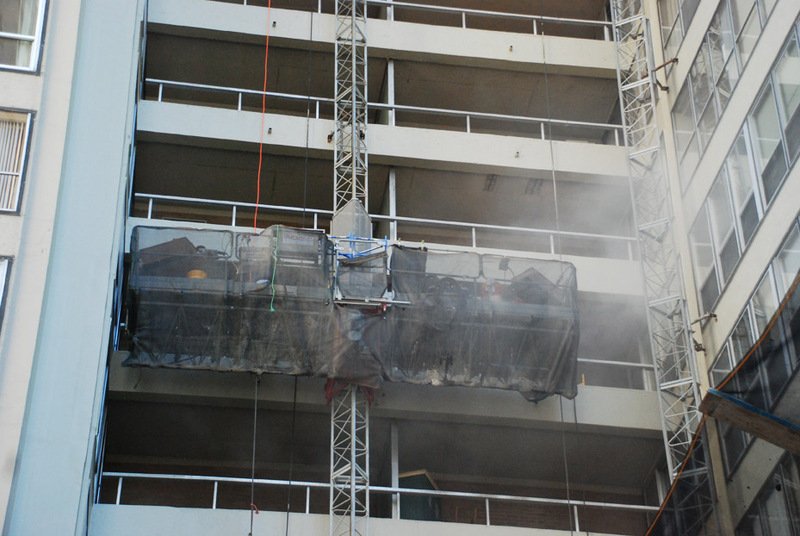 Did you know that they actually had to X-Ray the cement on the side of the building to locate floor slab tie locations? Yep. And after having it explained to me it makes total sense. You see the tall (dual) masts for the Mast Climber 3615 have to be anchored to the building at their highest point (for obvious reasons) while also being stabilized on the ground. This allows for the platform to climb up and down the masts effortlessly. Now, I never gave much thought on how they did it – just that they had to be attached somehow. 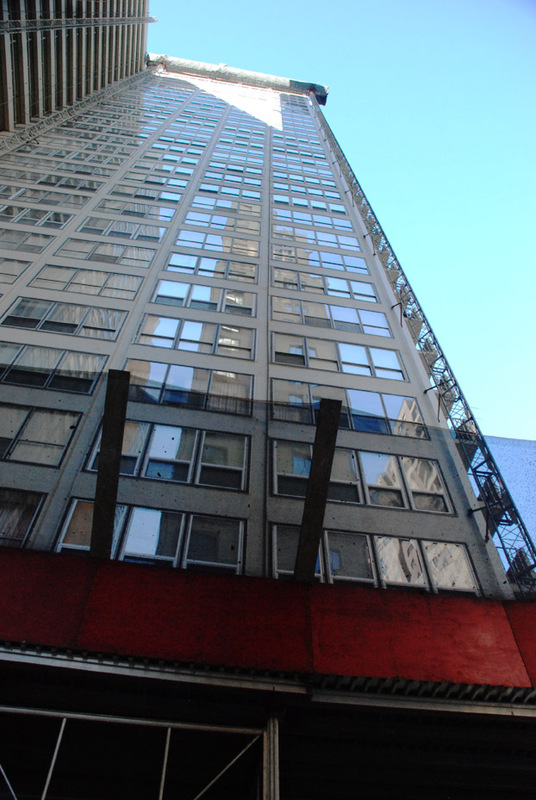 But logically, you just can’t go drilling into any place on the side of a building. You need a very sturdy anchor point. 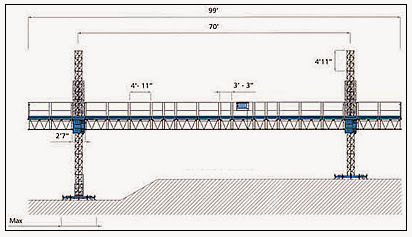 But since the Trump Marina was constructed with post tension floors there was the possibility of having steel reinforcements inside the slabs. Thus – the X-RAY machine! The X-Ray technician had to xray specific points on the building to determine if they were free of steel so the anchors for the mast climbers could be installed. And while he was up there, he also Xray’d the masonry condition of the exterior so they would have a better idea of what needed to be repaired before they put the new facade on. Once the technician gave the approval for the mast climbing anchor point – the crew had to cut out the exterior brick exposing the cement floor slab tie location so they could install the fasteners – and then the masts. 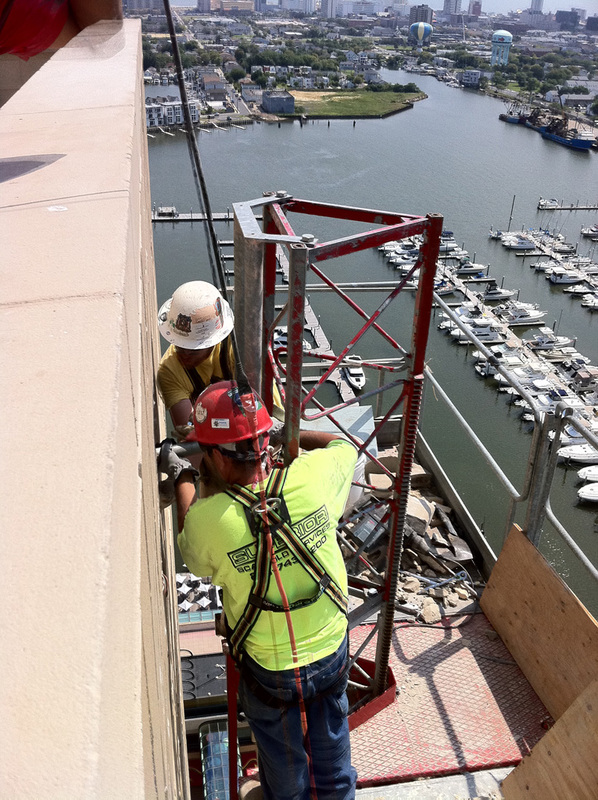 Here’s a great shot of the crew installing one of the masts at the Golden Nugget. And here’s the underside of the MC-3615 platform. And once both masts are anchored and the platform is in place – it can be put into service. Here it is going up for the first time. And once all of the 8 masts were anchored to the exterior of the Golden Nugget. This is what it looks like. If you look carefully, you can see the fourth unit on the right side of the building. An X-Ray machine? Who would have thought a scaffolding company would be so hip. 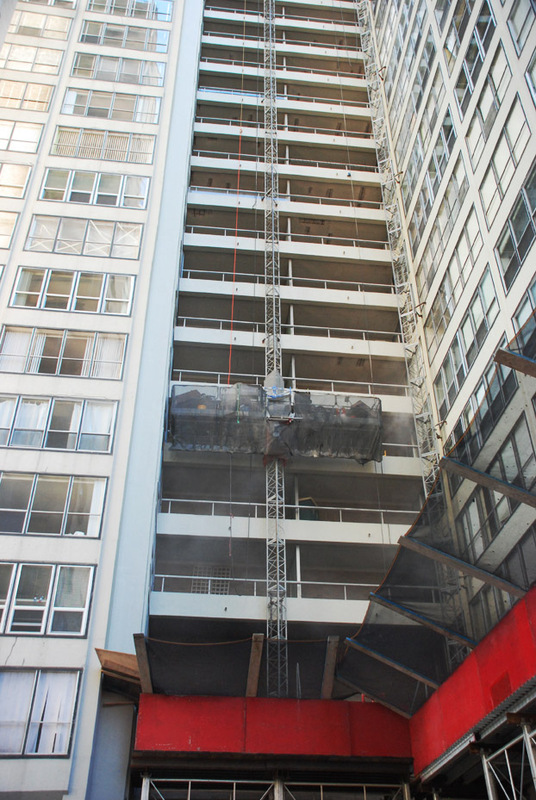 The work continues on the facade renovation. The workers used the mast climbers to install a unique scratch coat of a new type of material (specifically designed for this job) over the existing brick – essentially giving it a facelift. I’ll have more shots in my next entry. 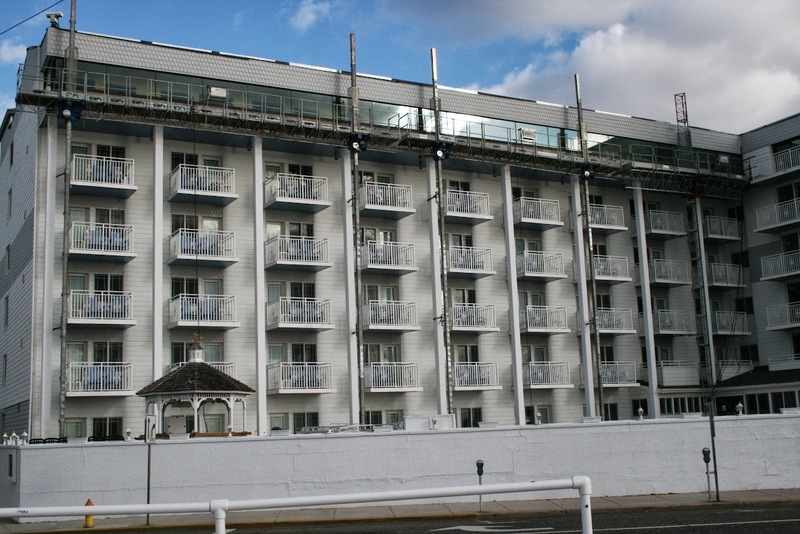 The former Trump Marina hotel and casino, in Atlantic City has been purchased by Landry’s Inc., an international gaming and restaurant operator and is being rebranded with the Golden Nugget name. 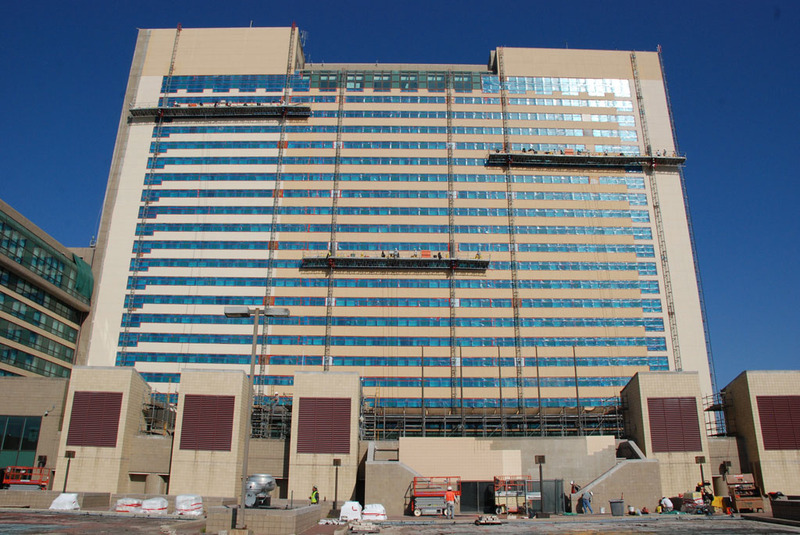 Superior Scaffold has been brought in as part of the $100 Million renovation to help restore the facade with an EIFS (Exterior Insulated Finishing System), restoration of the 90′ high Crystal and 220′ high Bay Towers of the Golden Nugget. 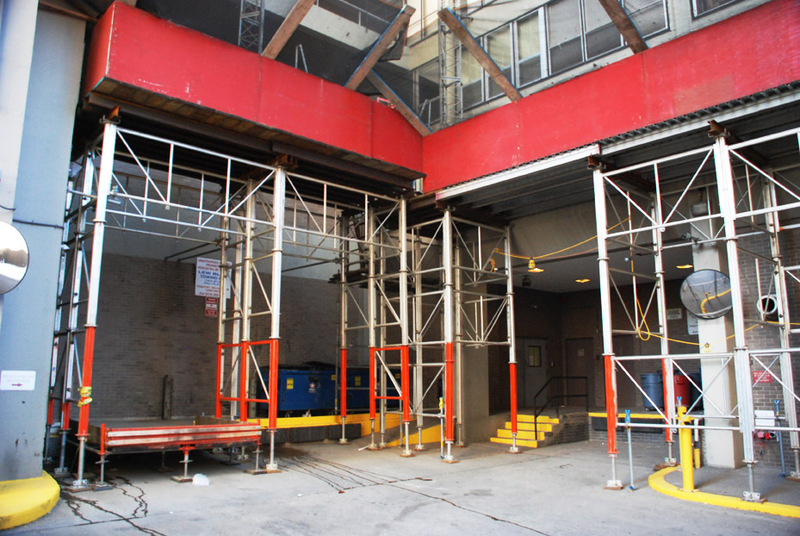 Superior’s rental department will be installing 18 swing stages and 4 mast climbing platforms! 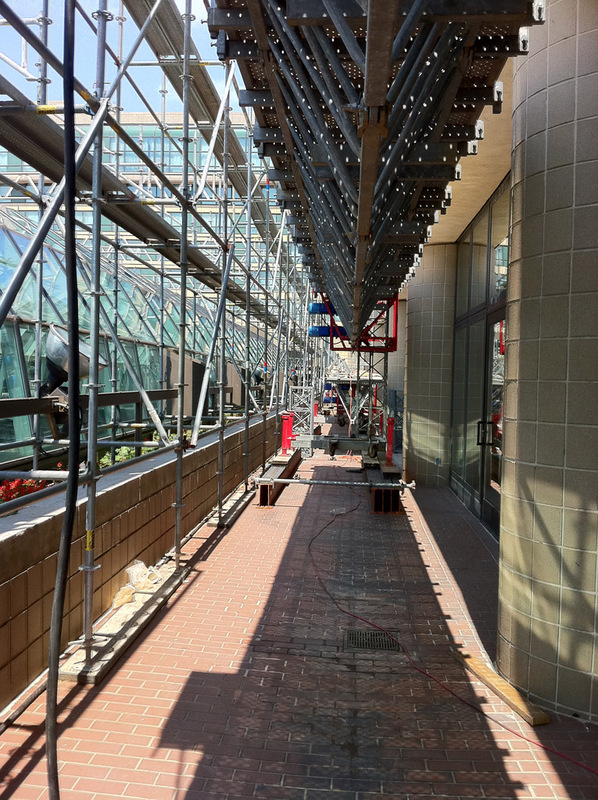 They will also install 170′ of overhead protection for the Atrium glass on the pool deck and stair towers for access to the sixth floor roof. We will post pictures soon – as it should be quite a site. Here is an artist rendering of what the finished renovations will look like.